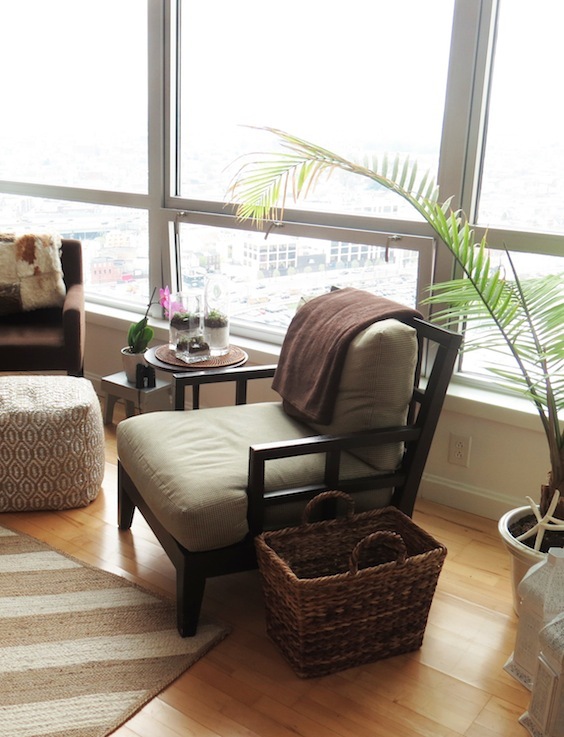 Recently my mom moved into a new fabulous condo in our hometown of Philadelphia, overlooking the Delaware River. 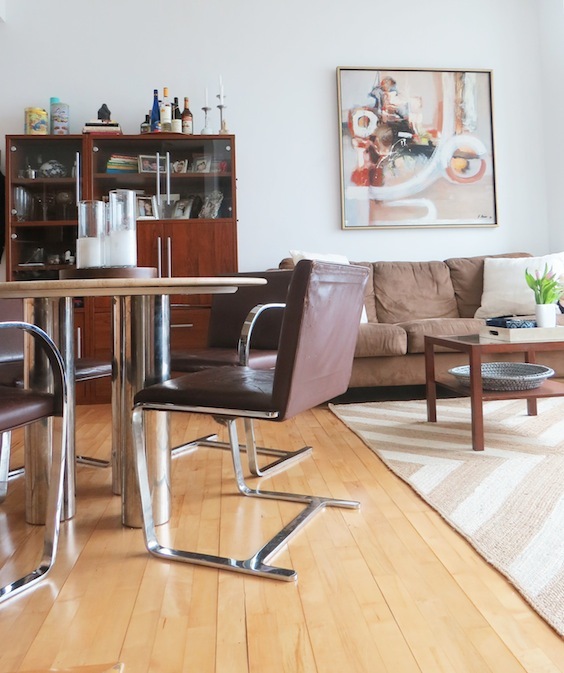 Although this was an exciting move for her, she was downsizing from a much larger two bedroom home (with a huge garage) into a much smaller one bedroom apartment. We wanted to focus on two things: SPACE & LIGHT. It was important to use the space as well as we could to fit in as much extra storage space as possible. 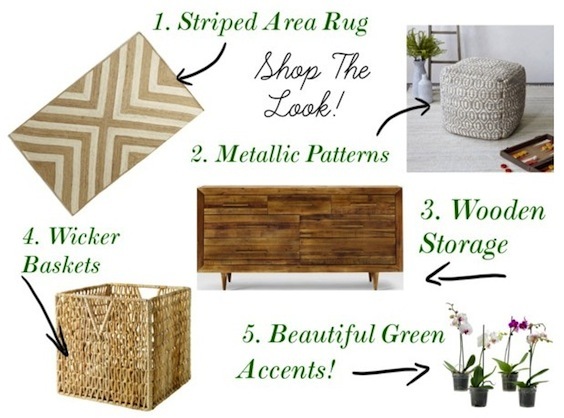 We also wanted to keep the space light, bright and airy… no black or dark colors but more of a zen feel with greenery, wicker and white being the main components along with metallic accents. Take a look at some images and also shop the look. Solids & Patterns… we kept the use of patterns to a minimum just focusing on the rug, pouf and artwork as points of beautiful patterns in the room. This made the pieces feel vibrant and really pop, even though they were completely neutral in color. 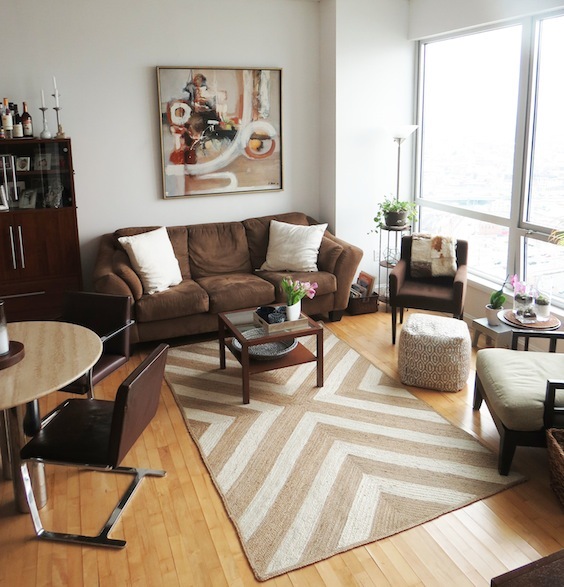 We kept all of the solids in tones of brown and white for a natural feel. Storage … we made sure to use this Ikea storage unit (similar here) as part of the “dining room”. 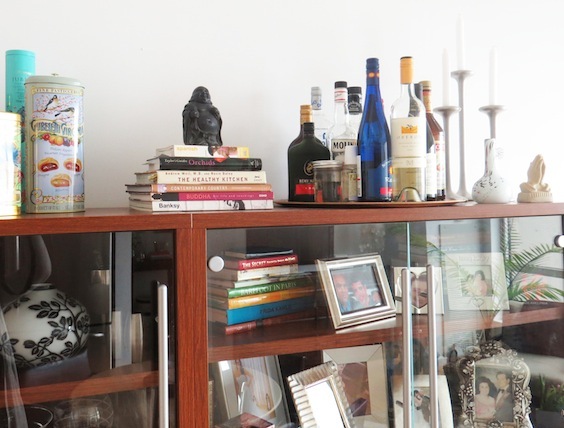 It gave us loads of storage, beautiful diplay shelving for frames and family heirlooms as well as storage on the top which we created a “mini” bar with storing all of the bar bottles on a tray. 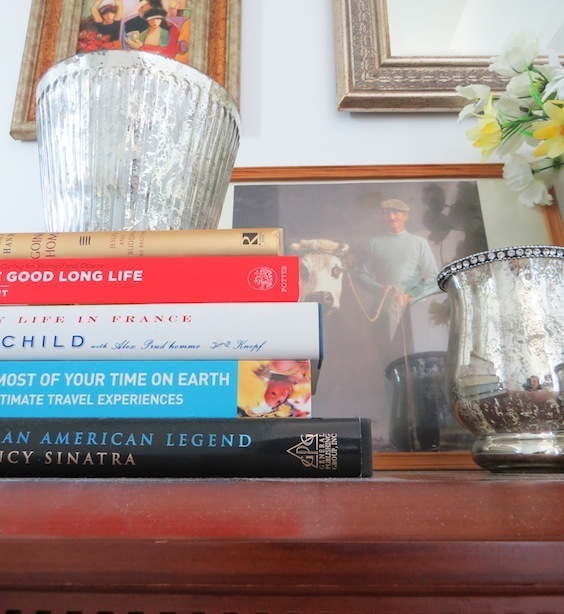 This is an essential small space piece. Greenery Accents… we placed plants and succulents by the windows. These are small accents that are essential to bring in life and color to a natural space. 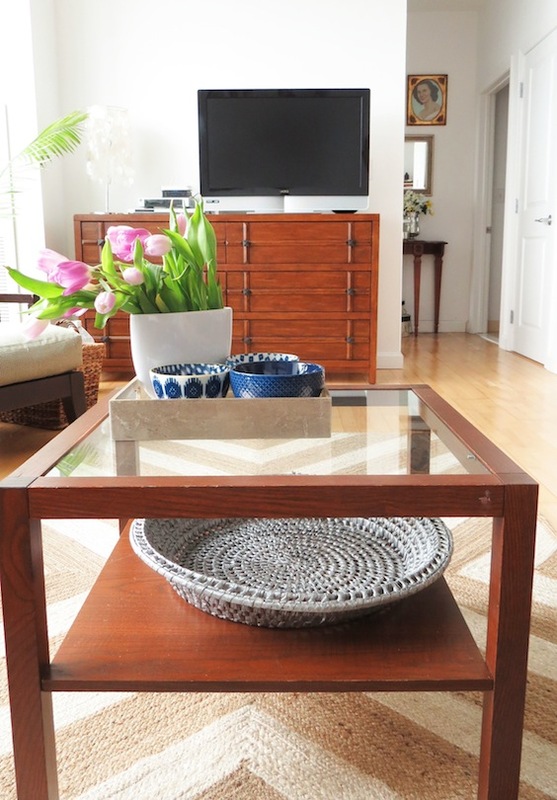 Oh and we used wicker baskets for more storage and keeping with the natural vibe of the room. 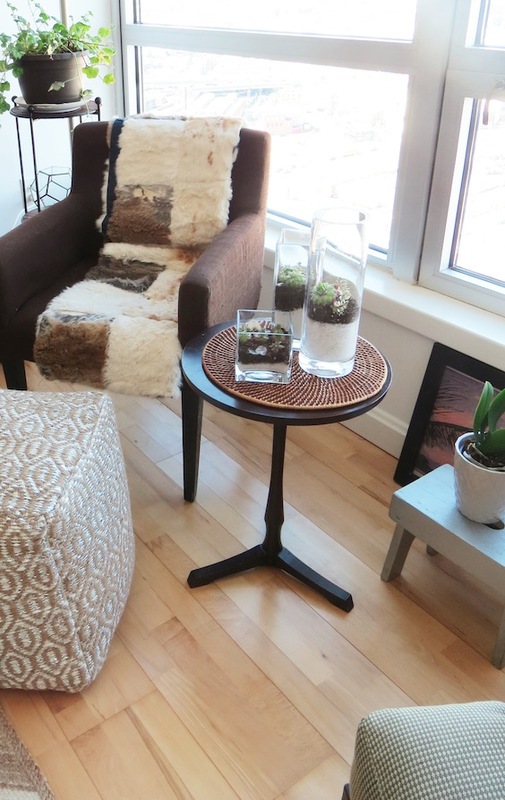 Floor accents… this amazing pouf from West Elm was a new addition. We loved the metallic color and beautiful pattern. 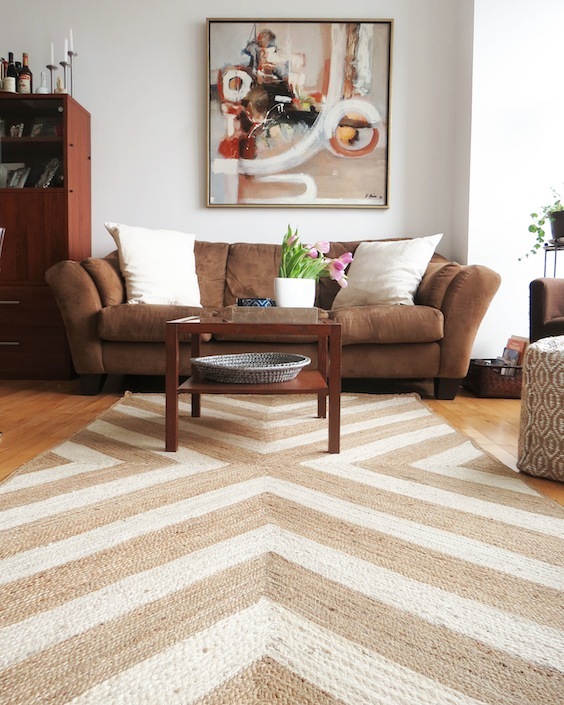 It worked well also with that incredible geometric striped rug (also from West Elm). 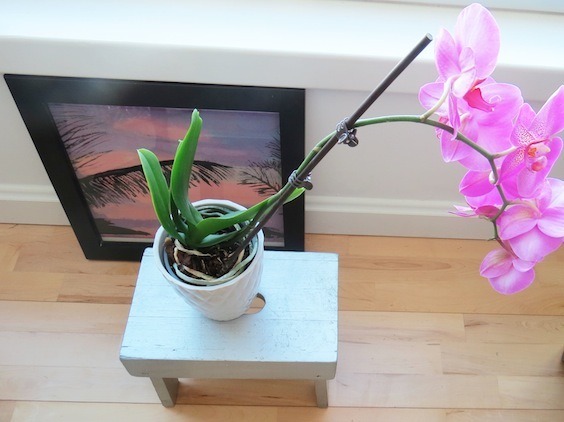 The only other color pop we included was this pink orchid and a pink painting (that I made when I was 8). Tip: with limited wall space, don’t be afraid to lean favorite items on the floor, it still works and gives the room character. Tables… we decided to go with a smaller size square coffee table (the other option would have been circular). This allows for the maximum amount of available space in the living area (rectangle would have taken up too much space in this instance). The dining table was also circular (for maximum space…plus this set is a beauty!). TV Unit…. ideally we wanted a low discreet tv table for the room, again because of storage we opted for using this (amazing) chest of drawers as the tv stand. My mom was just as happy with it and it gave us 6 large drawers for extra storage space. 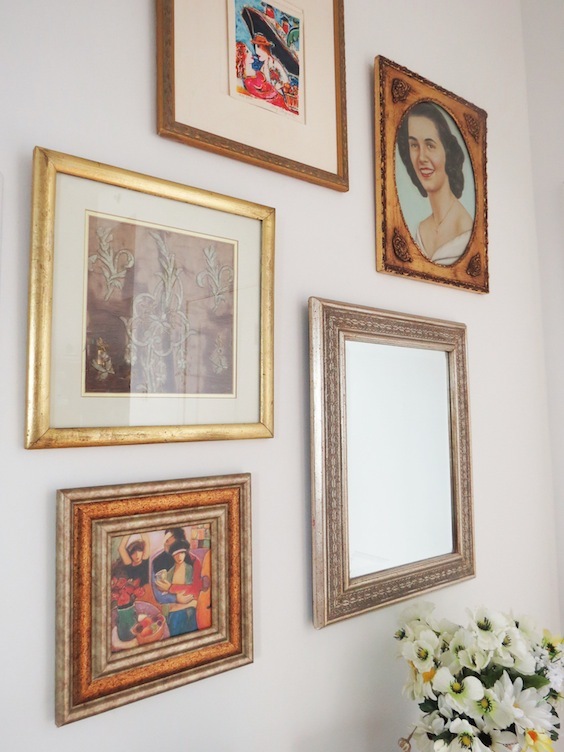 Gallery wall / Hallway Vignette … Since we were accenting in metallic I thought it would look beautiful to do a small gold gallery wall (this includes my favorite drawing of my grandmother which was done in Korea in 1953). I’d love to know how this rug has held up over time? Expecially the white, I really want to order one but am worried about it with my toddler! Thanks for your question! I actually used this rug to design my mother’s home. I asked her about how it has held up and she said generally well. I think that the white sections will always be a concern in a high traffic area. 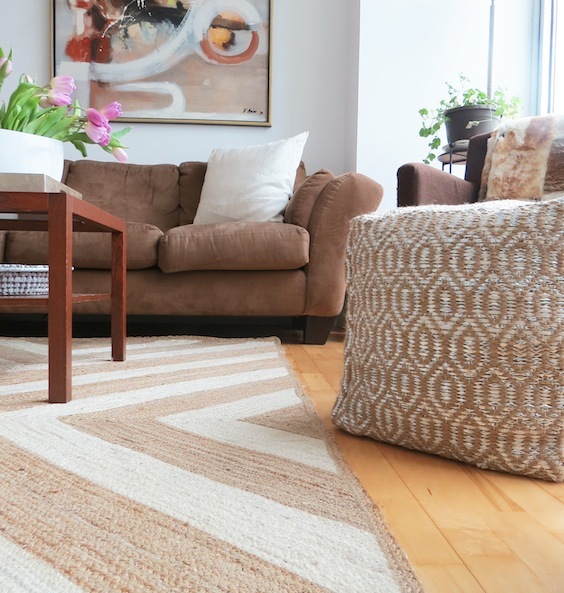 This rug though is made from a woven material and should be easy to clean. I hope this helps. This is one of my favorite rugs too! I care for such information much. I used to be looking for this certain information for a long time. of him as no one ese realize such specikfied approximately my trouble.